overland-underwater.com - A Charity Drive UK-NZ - Curses for international time zones! Curses for international time zones! Written by Maz Towns. Uploaded 28 January 2006. For those less fortunate who haven't been able to follow our stories since leaving the UK, you can now go back and read each story in order by viewing the 'picture of the week' album under the photos directory or by the 'previous' link above the current pic of the week. You can also see all the video clips we've made so far under the video album in the photos directory. Having enjoyed one of the very few photogenic sunsets in Iran, we drove for a couple of hours towards Kerman. With the roads being so good, you can drive at a reasonable pace. We began driving on the dual carriageway out of town to try and get some miles under our belt before finding camp. (Against our rules I know!!). It was hard going with trucks rumbling by with full beams on and it was only when a light which seemed too close caught my eye, did I look up to see a truck coming straight towards us! I shouted to Alex, who was oblivious and still in dual carriageway mode, not realising we�d moved on to a single lane road! Sharply pulling over to our own side of the road (thankfully we hadn�t begun overtaking the car just in front of us), we were both more than a little shocked at how close we had come to a head on collision � the worst �near miss� of the trip so far. Shaking and deciding we needed to get off the road for the night, we again found camp in the form of a road under construction! It will be interesting to go back to Iran in 10 years time to see what is actually left of the mountains! We treated ourselves to a beef stir-fry after setting up camp. It was really nice to have a change and apart from the meat being �slightly chewy� it was delicious. We headed to Aramgah-e Shah Ne�matollah Vali, a 15th century mausoleum. It had a teahouse, which was really the main reason we were going, but we thought we�d take in the site too! Having made it through the main entrance we were pounced on by a ticket man. Wanting a Kings ransom of 5 times the price of anything we had paid to date, we decided we weren�t that interested and began heading back to the teahouse. I realised I was by myself at the tea house, so went to find the boys who had headed further on rather than turn round after someone pointed out that the ticket was just for getting on to the roof to see the views. We headed in to the mausoleum where there are a few rooms to look round, decorated with tiles and Indian doors, some inlaid with ivory connecting each room. Just off one of the main rooms, there was a very small prayer room adorned with hand painted Quranic verses. Inside the mausoleum, lots of ladies were interested in talking to me asking where we were from and how we liked their country. As I was walking away from the small prayer room, one lady walked past me and in English asked if I was Iranian. I said �no, I�m from New Zealand� and she replied, �Oh, that�s OK then� and walked off! Weird. After walking round the big courtyard at the back of the building, we ventured outside to go back to the tea room. We sat down and ordered some �chay�. In the traditional teahouses, you sit on a square bench covered in material that also acts as the table. It was extremely busy with friends and families drinking and smoking water pipes enjoying their weekend, so chay was taking a long time to arrive. In the corner of the teahouse next to us, an alcove was sectioned off with a beaded curtain. A group of about 15 people looked like they were having party. We could hear lots of laughing and shouting and they looked like they were having a lot of fun. Most of the girls in the group had let their head scarves slip off and we assumed they must have been Christians; it was a public teahouse after all! Eventually chay arrived, but not before a girl called Neda sitting on the table next to us, had come over and introduced herself bringing a bag of mixed nuts for us to enjoy. Again, interested in who we were and what we thought of Iran, we talked with her for a while before she returned to her family. We were just chatting amongst ourselves when one of the guys from the party in the corner popped his head through the beaded curtain and offered Alex a mug and said �would you like a drink?�. Alex said thanks and took it. It contained a deep red liquid, which looked very much like the hibiscus tea we had had in Egypt. Lovely. Alex took a sip and then pulled a face, asking what was wrong, he said to Martin, �try this�. Martin took a sip and passing it on to me exclaimed �It�s wine!�. Alex said, �yeah I thought so!� VERY tasty it was too! The group by now were laughing at us, realising we had worked out it wasn�t hibiscus tea after all and we turned to thank them for our drink. Wine, in Iran, in a public teahouse!!! Hmmm. I�m sure we�d have been shot if we�d been caught! Slowly, two by two, people from the party came out to talk to us and find out who we were. We began talking to Angela and Shiva and soon we were surrounding by most of the group. It would have been better if we�d have joined them on their floor space rather than ours, as there were only so many people we could squeeze in the space. The next two hours were spent having our taro cards read by Shiva (we all have good outcomes!) and chatting to different people in the group, keen to see if we liked the wine. It was home made (I never did find out by who) and had been lying for the last 7 years maturing. It really was delicious. We explained what we were up to and Angela and Shiva were keen to know where we were staying. We explained that our home was the car and we were camping, which at the temperature outside horrified Shiva! She immediately said she would like to give us a bed for the night and we didn�t really have to think long and hard about it! Next on the agenda for the group were the Bagh-e Shahzade gardens and after asking us if we�d like to join them, we all packed up and left the teahouse. Angela and Shiva were keen to have a ride in the cars, so Shiva squeezed in next to me and Martin took Angela and another friend in his car. This is quite a normal was of travelling in Iran�..It�s called �see how many people you can fit in a car�! We�ve noticed driving throughout the country that if there is a small space in a car, you will be able to squeeze someone into it! We followed in convoy to the gardens and upon arriving, Alex and Martin were told to don hats and walk arm in arm with the girls while I was positioned in the middle of the group as we all walked past the entrance. We were obviously Iranian and therefore they managed to get us into the gardens for the cost of an Iranian, rather than foreigner at 7 times the price! The gardens were beautiful, with tall trees and flowing split-level fountains through the middle of the garden, leading to a large palace at the end. Lit up at night it was really nice, but unfortunately we hadn�t got our tripods to take any good pictures. We wandered up to the top and Angela was explaining we were passing a bathhouse, but was closed so we couldn�t see it, just as the caretaker walked past and said he would open it for us! There was no lighting as the electricity had been turned off, so we all walked through the hammam with mobile phones on or little torches attached to our key ring so we could see a little of how well preserved it was. We spent about an hour in the gardens before we snuck out again so the guard didn�t see we weren�t Iranian and got back to the cars. Not really sure what was next, but hoping it would be food as we�d not eaten lunch, we were told that we were going to dance! Laughing (thinking they were joking), Martin and I joked that we�d just pop off to the local nightclub for a boogy (as there are no nightclubs in Iran), when everyone jumped into their cars again and we were told to follow. Off we went (not really sure where) but followed the car we had been told to follow. After about 20 minutes driving, we pulled off down a dirt track and into a field. Still not really sure what was happening, the lead car put on his hazard lights, opened all the doors and the boot and turned his music on really loud! We really were making our own disco! Suddenly the field came alive, head scarves were lost and everyone began dancing. We were just standing in bewilderment to begin with, but before long we were dragged on to the �dance floor� to get jiggy with it! I guess if your government isn�t going to allow you to have official discos, you�re going to make your own. It felt like the illegal raves that used to happen in warehouses in the UK in the 90�s and was all very surreal! We started off with Iranian music and they began trying to teach us Iranian style dancing. Very amusing for all of us, especially them as Martin, Alex and I began gyrating our hips and moving our arms in snake like motions, mimicking their dance moves. After a while of making ourselves look stupid, they said they were going to put some European dance music, so we could show them our moves. You�ll never guess what came over the speakers�� That b! **$y Axle F frog song� NOOOOOOOOOOOOOOOOOOOO! We couldn�t believe it! After suffering it so many times in Turkey, we�d hoped we�d heard the last of it. They couldn�t understand why we were laughing so much and it would have been hard to explain, but we were treated to a performance by one of the guys of break dancing that was amusing to watch. Dancing the night away, I looked at my watch and it was only half past seven! With daylight only lasting till just after four, it felt much later. If someone had told us we�d be dancing at an illegal party, SOBER, in Iran, we�d never have believed it! :o) We made a fire to dance around, but the wood wasn�t catching, so Martin got out the paraffin we�d bought to show them how to make a proper fire (only slightly cheating!!). They then proceeded to jump over it rather than dance round it, telling us it was for prosperity. We all had a go before the fire burned itself out. After two or three hours, they began looking anxious and told us we needed to go as we�d been there too long and we might have been caught by the police. We all jumped back into our cars and headed on for food. Excellent. Angela and Martin had made a detour to Angela�s house to pick something up but had only told us that they were going, but not the main group. We stopped by the side of the road when they noticed Martins car was missing but Angela was the only one without a mobile phone and Martin�s wasn�t working so we couldn�t get hold of them. We kept telling them they would meet us at the restaurant, but they weren�t convinced! Eventually we managed to avoid an international incident and persuade them that Angela knew where we were going and we headed on to the fast food restaurant. Spoilt for choice, we had to make a decision over whether we wanted beef burger or chicken burger, to which Martin and I had the first choice and Alex the latter - all with a side portion of chips. Filled the hole. After paying the bill (which was a long and tedious process of calculating exactly what every one had eaten and working out costs! ), we had a photo session (where Shiva and Angela removed head scarves at every opportunity) outside the restaurant and then headed back to Shiva�s house. We stayed up chatting till 1am with her mum, sister and husband (who had come over for the night just to say hello to us), all who couldn�t speak English so Shiva translated. Originally, we were only staying one night in Kerman with the plan to then head towards Bam, but with the offer of a tour of Kerman by Shiva and Angela the next day, we were soon booked up to stay another night! We were having a lazy morning after breakfast, when Angela phoned up saying if we didn�t get a move on, all the shops would be shut! With the washing bag bursting at the brim, Shiva�s mum kindly took our clothes to wash them before we met Angela in town, the first stop being the bazaar. There were lots of craft stalls on show from other towns and cities and the girls explained what the handicrafts were and where the stalls were from. We bought a range of sweets, berries and spices - it�s amazing how cheap you can get stuff when you�re with a local! Next stop was a visit to a bathhouse. Shiva made us wait outside while she went in and bought Iranian price tickets! Dishing the tickets out to us, we all trundled past the ticket man down the steps. He didn�t stop us, but obviously we looked like foreigners! After finishing the sight seeing of that bathhouse, we then went to another for lunch. Chicken and rice it was all round, the variation to this dish being the boys had cumin rice and Angela and I have barberry rice, while Shiva opted for Dizi. While waiting for lunch to arrive, Shiva tried to teach Martin her party trick � rubbing her fingers together in such a way, to make a really loud click. I think it will take a while of practising yet before Martin gets the hang of it! There was local music being played in the background while we ate, it was a very leisurely lunch. We spent the afternoon being shown round the library and old icehouse. After picking up the cars again, we drove past a �Toyota� garage, so popped into see if they had any alternator belts, sadly no, so Alex enquired about changing the brake pads. They quoted $8, which seemed reasonable enough, but outraged Angela who said she had a friend who was a mechanic who would do them for less. We tried explaining we were happy to pay, but she would not take no for an answer! Watching us talk on the walkie talkies, the girls soon got the hang of it and began chatting to each other while we were driving, making sure they were taking us in the right direction to meet Angela�s friend. We then went to Angela�s friends garage to change the brake pads (for $3 less than our first quotation), when we had yet another visit from the police!! They were quite officious when they turned up, not being able to speak English and wanting to see our passports and know exactly why we were in Iran. Once again, our �official tour guide� Shiva stepped in, with the help of Angela and between them explained what we were up to. This seemed to placate the guys, as they suddenly became extremely friendly and thanked us for visiting Iran. I�m not 100% sure exactly what the girls told them, but I think they may have hyped us up a little more than needed! With brake pads sorted, we returned to Shiva�s house for a bit of a rest while she went off to her English class. Angela had class too, but as she had skived Uni all day anyway, decided she wasn�t going to bother. The girls plan for us had been to relax for a while and then meet Shiva after class. With time ticking we managed to get to an internet caf� while Shiva was in class, but with traffic being quite busy and then the internet connection being painfully slow it was soon time to pick up Shiva. I left the boys and went to pick up Shiva from class with Angela. Again, all three of us squeezed into the front two seats and we returned to the boys before heading for pizza. As soon as we were back in separate cars, the girls began talking on the walkie talkies again � they would not shut up! It was very funny. We ordered pizza, again with the obligatory tomato ketchup, but realised that between us we didn�t have enough money! We asked if they would take dollars, but they refused. Luckily for us, one of the guys who�d we�d been with the night before was also in the restaurant and he took the dollars and gave us rials in return! Thankfully we were saved from the dishes. One last sightseeing tour before dropping Angela back home, we drove up the nearby mountain to look at the city by night. It was spectacular all lit up and a lovely end to the evening. The next day we bid farewell to Shiva�s family and thanked her mum for the cookies and sweets she gave us. We dropped Shiva in town, after repeatedly telling her we�d be fine getting out of the city by ourselves, before beginning our drive further east to Bam. Whilst driving out of the city, there was a car driving next to us beeping like mad, I look round to see two guys in the front seats so turned back again. They pulled up beside us again and suddenly I saw Shiva waving like mad in the backseat!! She�d found two friends with a car and asked them to find us and show us how to get out of town! We had another emotional goodbye before managing to drive out of Kerman for the last time. With the demise of Bam, there are a few other structures contending for the title of �new Arg� (Arg means citadel surrounded by fortified walls). We visited Arg-e Rayen, on a hill overlooking the town, it�s about one quarter the size of Bam. Having been abandoned for 150 years, it has recently been restored but in true overland-underwater style, we arrived 30 minutes before closing! We managed to climb the ramparts to get a good look at the town below and mountains in the distance then had a quick wander round the rest of the walk ways within the walls before getting kicked out. With less than an hours drive we arrived at Bam. With crumbled walls and shopkeepers still working out of large shipping containers, it was amazing to think the earthquake was nearly two years ago. Looking like a shantytown, it was obvious rebuilding the city was going to take a very long time. Having all seen pictures of the once majestic, fairy tale citadel - Arg-e Bam, we wanted to see it for ourselves as we�d heard conflicting reports about whether it was worth a visit. Greeted by scaffolding all over the front walls, we entered the main gate and headed down the make shift walkway. Devastation would be the first word that sprang to mind, with crumbled walls and shattered mud-brick houses all around, but Bam still really is an impressive site. The pure scale of the brown lanes, bazaar and citadel above it are striking. We got as far as we could before turning round and slowly walked back to the cars as the sun set over the ruins. We had a great night and made a beef and vegetable curry using some spices that Ziggy had picked up in Quetta. Very, very tasty. You can�t visit Bam without trying the infamous Bam dates. Having sampled many on our journey throughout Iran, these were exceptionally good. So, stocking up on a dozen boxes of them (really, there was a little space left in our cars to store them) we felt we had bought just enough! Replicating emails in the morning before leaving Bam, we left at 10am on the dot as the border closed at 5pm and we wanted to make sure we were there in plenty of time. The scenery was beautiful with mountains and then flat green plains, apart from the police towers that cropped up every so often, many riddled with bullet holes. A harsh reminder of the troubles still around and why we had been advised by the British Embassy not to travel to this part of Iran at all. We passed through Zahedan, the last town before the border to fill the cars to the brim up with diesel. After receiving lots of directions from people about where we could actually find it, we ended up following a guy kind enough to take us to the station. We�d never have found it by ourselves and we�d been looking for nearly an hour. After the final fill, we worked out that it had cost us less to drive from west to east Iran, just under 5000km, than get a cab home from the centre of Guildford to our house (less than 5km)! Everywhere is now going to seem expensive for diesel! 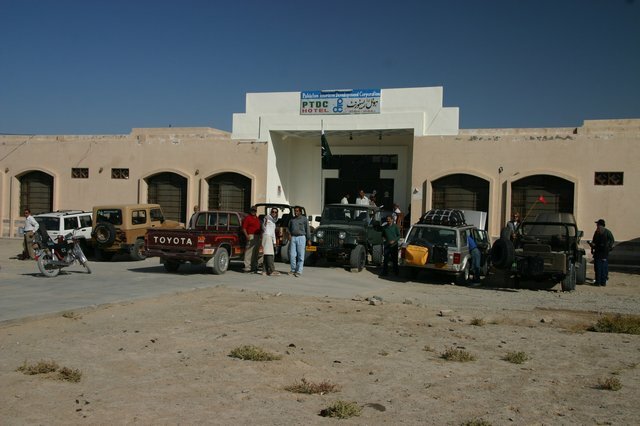 We had a trouble free drive through bandit country and reached the border at 3.25pm, plenty of time to get through customs to meet our Pakistan 4x4 enthusiasts the other side of the border for dinner. Having shown our passports to the men at the gate, they let us through to the border area. However, on reaching the customs house, they had packed up and were just about to go home. Confused at the situation, they told us the border was closed and we�d have to wait until tomorrow. After begging, pleading, shouting, telling them we had friends to meet the other side and that our visas would expire at midnight, we were no further forward. We couldn�t understand it, until we realised that Martin had been looking at the Pakistani guidebook for times and we hadn�t factored in the one and a half hour time difference between countries. D�oh! We were stuck. We raced back to the passport checkpoint to see what they could do to help us, but they were no help and told us we�d have to wait til tomorrow until the border opened again. Stupid time to shut a border if you ask me! We were not impressed. One man was quite helpful and told us of the border hotel we could stay at and that food would be served. We told them we had no Iranian money left and they said we would be looked after. Taking one look at the hotel, we were pleased that the manager said there were no rooms left. I�m not really sure who stays there, but it was the grimmest looking place you�ve ever seen. We said we would camp in our tents but would like food and to stay in the main dining area until we wanted to go to bed. Thoroughly p�d off, we got out the laptop to catch up on a few bits and bobs. The restaurant was beginning to fill up with truck drivers, all eating the staple diet of rice and chicken. It looked OK and we were wondering when ours would be served. After a couple of hours we still had no food and when the cook packed up and sat down to eat his own food, we tried to mimic that we�d like some food and eventually he got the message. He bought us rice and a piece of chicken. After dinner we decided it would be a good opportunity to try and relax, so we decided to watch a DVD � the first of the trip for me and Alex, what a treat. Ricky Gervais � �Animals� it was and after organising our cinema sweets (Bam dates, sweets from Shiva�s mother and ginger ball things), we settled ourselves down for an evening of entertainment. Desperately trying to get through to the Pakistani lot to let them know we were stuck at the border, we had no luck in reaching them on their satellite phone. We hoped they wouldn�t leave without us tomorrow. Enjoying the stand up comedy, every so often we�d get a truckie come over to see what we were laughing at. I�m not sure they get stand up comedians in Iran yet and they must have wondered why on earth we were nearly crying at this man, walking up and down on a stage, talking a language they couldn�t understand. It was at this time that one man, who�d previously had a look over our shoulder to see what we were laughing at, returned. At this point, Martin made the comment that this was probably the most inopportune moment for him to return. Having already seen Animals, Martin knew that graphics were coming up next, and it probably wasn�t for this guys eyes. Now I�m not going to go into details (as there are children reading), however if you�ve seen animals you will know what I�m talking about, if you haven�t seen it, you really should � it�s a very good DVD! As the pictures kept changing on the screen, more and more truckies came for a viewing, I didn’t know whether to laugh or cry and I really wondered what they must have thought we were watching. They were looking at the screen in astonishment – I’m not sure whether it was because of the drawings they could see or because we found it so funny. Animals finished, and after dispersing the crowd that had gathered to enjoy the end of the DVD, we packed up to go to bed. Thankfully we had managed to get through to our friends the other side of the border to let them know we would be over with them as soon as we could get through customs. Returning to our tents, our chorus of dogs had lined up for their night time choir practice, and started up just as we got into bed. The next morning we were outside customs at 8am sharp to get the procedure started, as we had been told that we had to be over the other side for a prompt 11am start! Getting the cars cleared through customs was a straight forward enough procedure and luckily for us, the customs guards on the western border seem to have forgotten to have told the guards on the east about the need for Iranian number plates. They didn’t bat an eyelid and stamped the carnets unaware! It was the passports that were causing the problem. Painstakingly slow as a group of about 100 people had just come through from Pakistan, the guards seemed more intent on processing their passports rather than even look at ours. Eventually after a lot of shouting, they took our passports and placed them neatly on the table. Great! Eventually we got them stamped. We had a very enjoyable 3 weeks in Iran and felt we’d only just scraped the surface of an unfolding and enchanting country. Definitely worth a return visit to explore more, but now it was time to move to country 14. Hi Team, really enjoyed your adventures in Iran, despite all the troubles looks like making friends is a breeze. Especially liked the Frog song bit . NOOOOOOOOOOOOOOOOO!!!!!! Nice "BARF" picture, that's a suitably puerile level of entertainment for me. More of that please.